The Road Race season has officially kicked off with the North West 200 underway in Northern Ireland. The NW200 is one of the world’s fastest road races and is widely regarded as one of the two leading events in the international road race calendar along with the Isle of Man TT. Ask anyone in Northern Ireland, and they’ll normally tell you that the NW200 is the greatest road race on the planet, but on this side of the Irish Sea, it’s the Isle of Man TT that usually claims the accolade. But whichever camp you’re in, there is no doubting that both races make for absorbing viewing. And that’s why The Bike Insurer has put together this simple guide on how you can watch each race. How can I watch the 2016 North West 200? The North West 200 is Northern Ireland’s flagship motorcycle event, just edging out the Ulster Grand Prix. Unfortunately, the NW200 looks to be left without TV coverage in mainland UK. The NW200 is being streamed live on BBC Sport Northern Ireland online with Steve Parrish one of the main commentators throughout the event. As well as live streaming, highlights of each race will also be available online ensuring nobody needs to miss out. How can I watch the 2016 Isle of Man TT? The Isle of Man TT gets much more coverage, with ITV4 getting the rights to what will be the 109th Tourist Trophy. Overall there will be around 15 hours of TV coverage on ITV4, with highlight packages scheduled after every race at 9.00pm along with a qualifying session, a few review programmes and some other shows before the races begin. It all kicks off with a documentary on Ian Hutchinson on 30 May called ‘Hutchy: Miracle Man’, after his successful return to the Manx race last year. 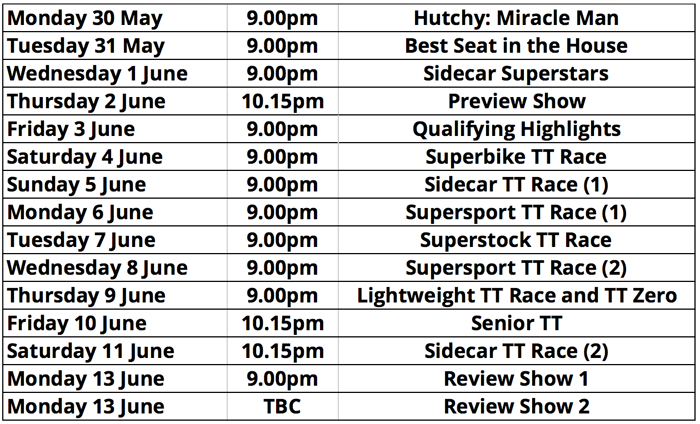 It’s also worth noting that ITV has stated that the times for these showings could change slightly due to the European Football Championship which is being held at the same time as the Isle of Man TT. Next page: What do the new speed limiter laws mean for UK motorcycle riders?